It's easy to reach from Burano: Just cross the small footbridge that connects the two islands. 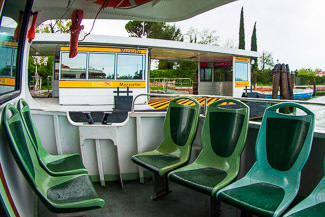 However, Mazzorbo does have its own waterbus stop, which means you can arrive on Burano and depart from Mazzorbo (or vice versa) if you want to explore both. Tip: See our article about a self-guided Lagoon Island Tour via public transportation. Mazzorbo has one small hotel: the highly-rated Venissa (B&B), which faces the Lagoon and has a Michelin-starred restaurant that serves white wine made by the innkeepers. Note: This station doesn't have a ticket booth or vending machine. If you don't feel like walking to the larger Burano station, here's what to do when you need to board a water bus without a valid ACTV ticket or Tourist Travel Card.